Thanks to my wonderful friend, Darcy (who humored all my talk about cooking and inspired me with this recipe and out of this world homemade pasta while I lived in Utah), this is now a staple in our house and has forced me to admit I can never go back to regular old oatmeal again. More like an oatmeal “cake,” this breakfast dish is wholesome (yes, I consider large amounts of brown sugar wholesome), moist and very versatile. You can add fruit to the batter before baking or lay it on after, you can douse your portion of baked oatmeal in milk and slurp it up with a spoon, or you can skip the milk and eat it with a fork. Any way you try it, it is sure to please. Personally, my favorite way to eat it is covered in fresh strawberries and milk. Thanks, Darc! Preheat the oven to 350 degrees. Mix all ingredients together and pour into a greased 9X13-inch baking pan. Bake for 20-25 minutes, until a toothpick inserted in the center comes out clean. Serve with milk and/or fresh fruit. The recipe can be easily halved and baked in an 8X8-inch pan. (Update 10/2010): Look to the comments to see how others have varied this oatmeal both in applesauce amounts and other creative ways. As for me, I’ve edited the recipe to use less brown sugar than the original and have substituted half the oil with applesauce. Recipe Source: adapted from my friend, Darcy R.
I’ve been making this a few times a month for the past few years, it’s a family fav. Today I subbed brown bananas for the applesauce and made it in muffin pan. 375 for 21 min = perfect. Kids ate them in a bowl with milk, then grabbed a second to gobble on the way to the bus because that’s how we roll. I’ve made this recipe several times and it’s a winner! Our favorite way to eat it is with a drizzle of real maple syrup on top. Delish! I always make the half recipe (8 X 8 inch square pan) and bake for 25-30 minutes. I freeze the leftovers, cut into squares. I love recipes that are easy, adaptable, and delicious – this one hits all those bases! Hi, I am a baked oatmeal lover and always look for new recipes. I’ve made this in the past and usually add pumpkin for a good portion of the oil,keep the applesauce at 1/2 and only use 2 eggs plus 2 egg whites. I like to bake this til crunchy around the edges. Would I be able to use melted butter, or mild olive oil for the 1/2 c of the oil ? This was delicious. Made with only 1 cup brown sugar and added 1 TB cinnamon to the batter. It was plenty sweet for us still. We served it up with the cinnamon apples from your waffle recipe. So good. I see that you suggested a day or two to eat it before it isn’t fresh. How well do you think would freezing pieces would work? Has anyone had any luck freezing this after it’s been cooked? Maybe I missed it and it’s been answered already, but can you put this together the night before and bake in the morning? Yes, I think many others have done that with good success. Do you think it would it work to mix this up and let it sit in the fridge overnight before cooking it? I think so – you might want to watch the baking time closely and add or cut down as needed. We are snowed in so I had to make due with what was in the pantry for dinner tonight. This was perfect! I had to make a few changes. I halved the recipe, added cinnamon and nutmeg, and substituted one ripe banana for the apple sauce. I was out of baking powder so I substituted 2 tsp vinegar and 1/2 tsp baking soda. I also added 1/4 cup crushed almonds for a little extra protein and cubed apples (2 small gala apples baked in the casserole dish with a little butter and cinnamon for 15 minutes, then poured batter over the apples and baked as directed). Delish! This will be a go-to for now on. Felt like I should comment since this is a recipe we make frequently! We have added all sorts of fruit, pumpkin purée, and played with the applesauce/oil proportions–it is very adaptable! We serve with milk. I have mixed up the dry ingredients ahead of time, brought it up to our family cabin, and then finished it there so we could have a yummy, comforting hot breakfast. Always a hit. Thanks!! OK, I know that this recipe is several years old, and has been made a bazillion times, but for anyone with food allergies, I thought that I would share some modifications that I have tried and been successful with. First of all, I always substitute 1 c. pumpkin puree for the oil and water, as well as add 3 t. pumpkin pie spice–because that’s the way I tried it the first time, and to be honest, it’s so good, I can’t bring myself to try it any other way! I also have tried a gluten-, dairy-, sugar-, and salt-free version where I use gluten-free oats in the same amount, maple syrup instead of sugar (1 c. because it tastes sweeter than brown sugar), refrigerated coconut milk–only 1 3/4 c. to make up for the added moisture in the syrup, sodium-free baking powder, and omit the salt. I will admit that I missed the salt a little bit–it didn’t taste quite the same as when I make my fully-leaded version, but I was surprised at how good it was! I would highly recommend it! Thanks for an awesome recipe with real ingredients that allow for some creativity! Love the variations, Emily. Thank you! Have been making a baked oatmeal recipe for about 10 years but wanted to try this one. We loved it! It’s just as good as my original recipe – really – it’s even better. Didn’t use any oil – just applesauce. Added 1 tsp. cinnamon and 1 c. slightly-thawed frozen blueberries. Had to bake it a little bit longer because of the blueberries but it turned out beautifully! Served with milk. My 11-year-old gobbled it up. This has become our go to pre-long run snack for marathon training. Thanks for sharing. I made a baked oatmeal “cake” for my daughter today. Both kids (4&6) gobbled it up. Thank you!!! I made this baked oatmeal this morning and my boys (5yrs and 2 yrs) and I devoured it! I halved the recipe into an 8×8, used 1/2 cup applesauce only, and reduced the brown sugar to a 1/2 cup and it was plenty sweet. I baked for 27 minutes and cooled for 5 before serving. Did add a few drops of milk over the top, it was a little thick, but I baked it longer so it wouldn’t be soupy. Thanks Mel! I was not expecting this to be as good as it was…holy moly, it’s delicious!! My husband took it for a breakfast potluck at work and everyone loved it and wanted the recipe! Thanks for another winner! Hi Mel! I made this for breakfast on Christmas morning, and my husband and I loved it. So easy, so delicious. My favorite part was the bit of crust around the edges. We topped ours with a blueberry sauce (like from your “Best Blueberry Muffin” recipe) and it was super delicious! I just had frozen blueberries and I thought, “I’m going to make the blueberry sauce from Mel’s muffin recipe!” We had lots of leftovers, since it was just the two of us, so I took them to my in-laws for brunch, where it was also a HUGE hit. Thanks for the great recipe. Just made this for breakfast. Yum!! My kids loved it. I didn’t have any applesauce so I put in pumpkin, it was great! Thanks for a recipe that everybody eats! Made this this morning before church. It was easy, yummy, and warm!! We put canned sliced peaches on top. Both my kids ate it up. My son asked if there was any left (yes!) but when he had finished his bowl his was full!! Very filling. Thank you! My hubby is looking forward to eating up the leftovers before work tomorrow. I made a 1/2 recipe for 4 of us with a good helping leftover. Hi, I just thought I’d tell you that my mom introduced me to this recipe around the time you originally posted it and I loved it. I woke up in the wee hours of this morning with my teething 1 yr old and couldn’t stop thinking about the recipe even though I hadn’t enjoyed it in about 2 years. I have since baked it, put my little one back to bed, and enjoyed a generous helping. Thanks for making my morning better! PS. I like it with raisins baked in. Lorie – I haven’t tried it with pumpkin but if it were me, I’d throw about 1 cup pumpkin puree into the batter and bake it like normal. Let me know if you try it! Hi Melanie, my son loved this the last time I made it and I was wondering how I can incorporate pumpkin puree so that I could like it too! Any ideas? I’m not good at baking at all so I’m clueless. This was amazing! And fresh nectarines were the perfect topping for it. Thanks for this and many other great recipes. Made this finally yesterday after eyeing it for a couple weeks! It was wonderful! I am about to heat some up for breakfast. Thank you so much for your website, I love it! Thanks for the feedback! It’s nice when people get back to you! Kudos to you for being so timely. =) I’m going to try the baked oatmeal soon and see how it is with less sugar. Thanks again! I’m wondering… is it possible to leave out the majority of the brown sugar (say only use 1/2 c.) and have it not affect the texture or the way it sets up? Is the sugar there just for the flavor and to add sweetness, or does it have a crucial role in baking process? Thanks! Lindsay – this recipe is very adaptable so yes, I think you could play around with the brown sugar amounts. It shouldn’t have a crucial role in the baking process, other than adding sweetness (obviously) and helping the oatmeal to brown. I loved this. My husband wasn’t a big fan of it. But I honestly thought it was so delicious! Thank you! Yum. I’m going to have to try this. I’m sure it’s best hot out of the oven, but how does it taste hours later or even the next day? Is is still as divine as it sounds? 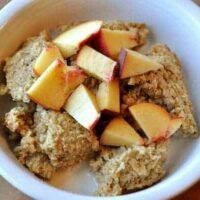 Heather – this baked oatmeal is great up to two days later, I’ve found, especially if kept tightly covered. Of course, it tastes best warmed in the microwave or oven again, but it seems to do ok within 1-2 days of eating. Love your site. Hey, I also loved the original baked oatmeal recipe that you posted… I want to try them both. Anyway I could get a copy of the first one that you posted? Thanks! Hi Ky – the original recipe had 2 cups brown sugar (instead of the 1 1/2) and 1 cup oil (instead of 1/2 cup oil and 1/2 cup applesauce). Hey–I just wanted to check in and let you know that I made this today substituting the 1 cup of oil for 1 cup of pumpkin puree and added about 2 tsp of pumpkin pie spice. It was perfect Mel! You wouldn’t miss the oil at all. I drizzled maple syrup over the top and everyone loved it. It was pumpkiny fall deliciousness. Man I love this recipe. 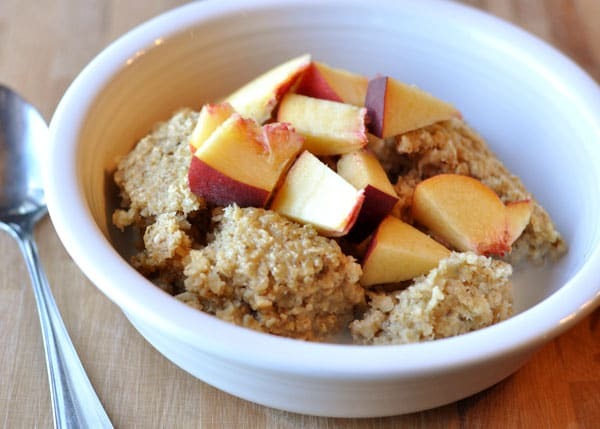 Reyna – wow, I’m actually surprised the baked oatmeal fared so well without the oil. LOVE that news. I’m making your exact version for my in-laws next week! Our family loved this. Now that I’ve made the basic recipe I can see the possibilities for all sorts of variations. This is going to be a breakfast staple. Reyna – I’ve actually wondered how this would be adding in some pureed pumpkin, blueberries, etc. The possibilities are endless! Love this for breakfast, we love it with peaches, so yummy! I sub all the oil for applesauce with no problems and I only use a quarter of the brown sugar, with the fresh fruit you don’t even miss it! My 4 little girls request it often, well actually only the 4 and 3 year old but the 1 year olds give their approval each time by eating seconds. The only thing I don’t like is waiting for it to bake!!! Kim – thanks for weighing in on this recipe. Sounds like applesauce works great! Hey Melanie! I have been making your baked oatmeal for a LONG time now. We just love it. I sometimes have those mornings where we need a really quick breakfast (okay so most mornings are like that!). So, recently I baked my oatmeal in muffin tins (I love the crispy edge-so this gives me more of that too!) and freeze them. So, when we are in a rush we can just pull some oatmeal muffins out of the freezer, microwave, and enjoy as usual without all the work! Thanks again! Alicia – I love the addition of vanilla and cinnamon – and peaches? Wow! That takes it over the top. So glad you liked it and thanks for including your changes! This was SO good! and I HATE oatmeal! My kids wont touch the stuff either, but with this recipe we all loved it! 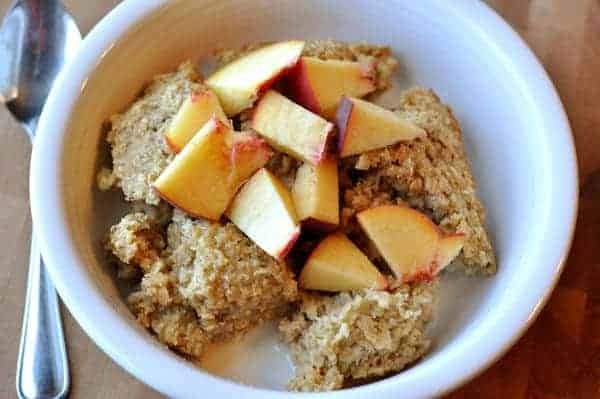 I am SO glad to have found your site and all your recipes but this one especially because now I can feel better about feeding my kids a healthy oatmeal breakfast! Sarah – despite your aversion to oatmeal, I’m thrilled you and your kids liked this! My kids aren’t huge oatmeal fans either, but they eat this right up (that may be due to how much sugar there is…but hey, whatever works!). Thanks for letting me know! I love your website! Thank you so much for making my life so much easier. One question, what is your recpie for the out of this world homemade pasta you mentioned up above. Is it somewhere on your blog? Hey Kim – I don’t have the homemade pasta dough on my blog. I haven’t quite perfected it yet – but it’s basically just flour, eggs and a bit of salt. I’m still working on getting it perfectly textured and rolled out through my pasta maker! Laurel – glad you liked this baked oatmeal. It is delicious with fresh strawberries, I can attest! Thanks for checking in to let me know. Made this for breakfast today and added fresh strawberries. It was SO YUMMY! There are so many possibilities with this. Thanks for the recipe! Islandgirl – I love the new name on this oatmeal and mostly, I love that you LOVED it so much! Thanks for letting me know…I bet the fresh blueberries were divine. Saw this recipe just about an hour ago and had to make it. I am not even an oatmeal lover but I love breakfast! I am renaming your recipe B.B.B. Baked Breakfast Bliss. This is comfort food at it’s best. This will become a staple at my house on Saturday mornings. I had it right out of the oven with a little milk and fresh strwberries and blueberries for lunch today.Thank you for this!!! Thank you so much for this awesome recipe. I’ll be making it over and over this winter for sure! mrsblocko – glad you liked this! I’m on my way over to check out your post. What a great idea! Does it reheat well or does it need to be eaten on the day it’s made? This looks delicious! I must try it! Cathryn – how nice, thank you for your additional comment. It made my day (and I’m so glad you are still enjoying the baked oatmeal…yum!). Honestly, yours is one of my favorite food blogs. Your sweet and sour chicken is to DIE for and I crave it constantly. This would be such a hit at our house! Combine ingredients and bake in an 8×8 pan at 350 for 20 minutes. I’ve also had great success substituting the applesauce for the same amount of mashed banana. It just gives variety to the flavor. I usually sprinkle a little cinnamon on top, too. I read the recipe, immediately printed it, baked it and am now TOTALLY loving it. Thanks! I made a glaze of powdered sugar, evaporated milk and a dash or two of maple syrup and poured it over the baked oatmeal right out of the oven. I then added a generous dollup of cool whip and YUM! I use applesauce, lots of cinnamon, dried fruit, etc. SO GOOD! Cathyrn – that’s the fastest anyone has ever tried a recipe on here. Thanks! I’m so glad you liked it. I absolutely love the glaze idea – and the whipped cream. Talk about a decadent breakfast treat. Maria – it looks like there are a lot of variations of this recipe out there. Thanks for sharing yours! Wow, is this good!! I made it for breakfast this morning and it was a total success! I halved the recipe and subbed half of the oil for applesauce. I also only had old fashioned oats, so that’s what I used. Not sure if it was the oats or the pan, but I had to bake mine for close to 40 minutes (8×8 or 9×9 pan…I can’t remember which it is!). Next time, I’m going to add a touch of cinnamon and try to cut the oil down even further. i really enjoy baked oatmeal, but you’ve gotta add the fresh fruit! i prefer blueberries, but i sure wouldn’t say no to strawberries. this is a great way to start the day, simple as that. Always looking for ways to get the kids to eat oatmeal. Thanks!!! jjnhubbs – I’m glad someone tried it with half applesauce and that it worked well. Thanks for the note about longer baking time. Glad you liked it! What an excellent & tasty looking dish! Amy – you can eat it anyway you like. I like to eat it warm with milk. My husband likes to eat it without milk. To each his own! This is AMAZING!! I’m not a huge oatmeal fan but Man o man do I love this!! It was so warm and just delicious! Totally recommend this one! Oh dear My Kitchen Cafe ! Honestly, how do you do it ???? If my husband ever ran away with another blog, I KNOW WHERE where he would be…at the kichen cafe !! He ADORES OATMEAL…. I mean, I like oatmeal, especially with LOTS of brown sugar… but he could eat oatmeal every minute of his life. Baked Oatmeal sounds divine, and really… I think I’ll make it and then serve it up this weekend for our anniversary ! Thanks for helping me look like such a fabby wife in the kitchen. Lori – my guess is that the pie plate is the issue with the baked oatmeal being mushy in the middle. The texture, when baked fully, is like a cake – a toothpick inserted in the center should come out clean, perhaps with a few moist crumbs. If you use your pie plate again, I would bake it longer next time. Good luck! Just finished making and devouring this! It was so yummy! I added a little bit of cinnamon and a little vanilla! It was delish! Thanks for sharing! What a fun recipe Melanie! It sounds so good! As soon as we get settled I will be trying this! By the way, we sold our home!! I am headed to GA house hunting this weekend! Yipee! The Conrad Family – oooh, I bet this was awesome with the addition of vanilla and cinnamon. I’ll have to make a note to myself to try that next time. Thanks for letting me know you enjoyed it! So do you eat the oatmeal with the milk or by itself? Hi Melanie, this may sound like a weird question but I never ate oatmeal (never liked it as a kid) so what should the consistency be like when it is done? I just made it and it came out hard on top and a little mushy on the inside. But I halved the recipe and made it in a pie dish b/c that was all I had. I baked it a little longer but maybe it needs more time? I have to tell you how addicted I am to baked oatmeal. I substitute applesauce for the oil and sprinkle cinnamon on top before baking it. I love this stuff! Mel – I’m glad to have another baked oatmeal authority testify that subbing applesauce for the oil works great. I bet the cinnamon on top is fantastic, too. I give you major props for doing anything in the kitchen with your new little one around!